The chunky shape of these extra-large charcoal blocks makes them captivating, intuitive, and great fun to use. From powerful lines to subtle gradients, Derwent XL Charcoal Blocks combine the natural qualities of charcoal with the strength and body of a chunky block. Soft meets strong, agile meets bold, to create the perfect blend of rich tones and organic marks. Naturally watersoluble and available in a variety of rich, dense colors, these opaque, rich blocks can be layered over other colors. Their size and length are great for making broad, gestural strokes. Create different marks with the sides, edges, and corners — you can even use an embossing tool to create lines and add texture. XL Charcoal Blocks are very tactile, so you can use your finger to smudge and move the color around. 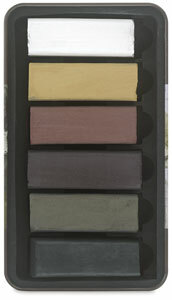 The set of six blocks contains one each of Ochre, Sanguine, Mars Violet, Sepia, Black, and White.